Since 1987 we have been manufacturing custom aluminum & stainless steel anchor bolts for the construction industry. Our success at providing custom or standard anchor bolts for a very fair price in a very short amount of time has led to our growth in capabilities. We have both roll and cut thread capability and can handle sizes up to 2″ in diameter and 20 feet long. We have made parts out of various grades of steel as well as aluminum and stainless steel and have a wide variety of material options available. We have also made welded anchor bolts and assemblies to specific customer requirements. We also produce special bracing and connecting rods utilizing turnbuckles and clevises. 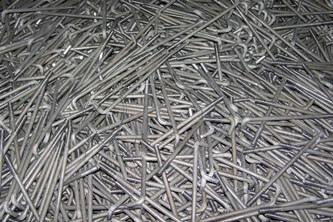 All of these products are available galvanized. Contact us today! We are eager to become your supplier of custom anchor bolts!